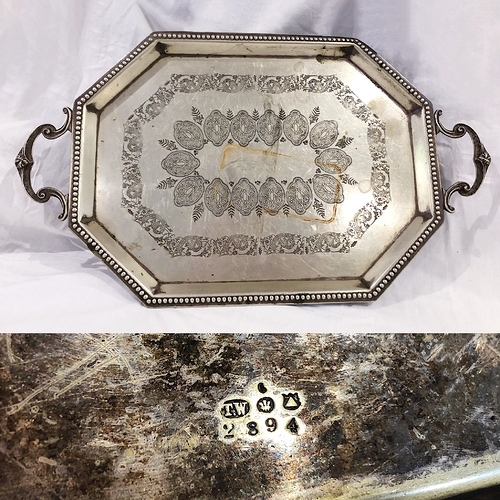 The largest internet forum dedicated to silver repair, hallmark research, antique silver identification, and restoration of silver objects. Identification Help - What is it? My father inherited a number of items from his grandparents, and we need some help identifying the origin, age, and possibly history of each item. Any help will be appreciated, thank you! The serving tray has four small feet on each corner and a repetitive pattern on the surface. This is an electroplate mark of (probably) Thomas White of Sheffield, active last quarter of the 19th century.